Trapezium area calculator - formulas and calculator for calculating area on-line. Formulas for all types of trapezium and special cases of isosceles trapezia are given. Trapezium area - is a numerical characteristic characterizing the size of a plane bounded by a closed geometric figure formed by four series-connected segments (sides), two of which are parallel to each other. A trapezoid - is a geometric figure formed by four series-connected segments (sides), two of which are parallel to each other. 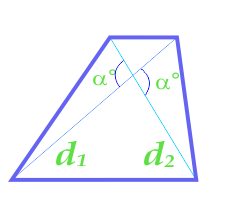 This formula is applicable only to isosceles trapezoids, into which a circle can be inscribed.